Sarah Tattersall is my 2x great grandmother. I wrote about her on 15 December 2016 – here. So this new post is an update resulting from further research and new information. Sarah was the illegitimate daughter of Mary Ann Tattersall and Ismael Yewdal (other spellings are available). The image below is from the England & Wales Non-Conformist birth and baptism records. Sarah Tattersall Daughter of Maryann Tattersall was born at Steeton in the Parish of Kildwick in the County of York, October the twelfth – one thousand eight hundred and thirty four. The father of this child is Ismael Yewdal. Dr William Greenwood Mitchell, Hannah Dale and Sarah Cowling present. Witnesses Susannah Tattersall, Martha Tattersall and Ruth Tattersall. Registered by Abraham Nichols, Minister April 22nd 1835. In my further research I have been able to establish that Mary Ann Tattersall (my 3x great grandmother) was the daughter of Patrick Tattersall and Mary Gordon (my 4x great grandparents). Patrick and Mary had at least nine children between 1792 and 1816. Mary Ann was the youngest born on 3 April 1816 – her brother Edmund was born on 5 May 1796. I believe these three young women are the witnesses named in the birth record above and are nieces of Mary Ann Tattersall. At the time of my original post in December 2016 I hadn’t been able to find Sarah on the 1841 or the 1851 census returns. I have now resolved these two issues. The 1841 census for Edmund Tattersall shows him living at Steeton, Kildwick with his wife Isabella and Susannah, Martha, Ruth, Gordon and Sarah. 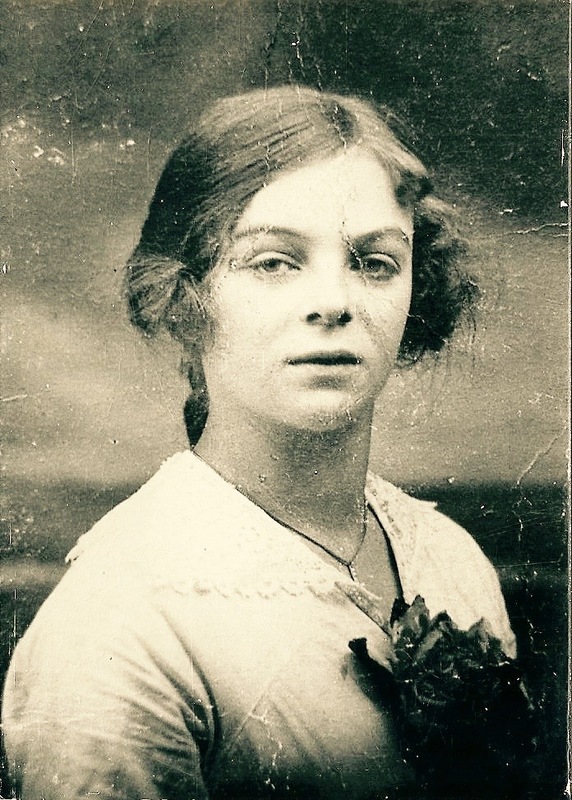 I am confident that this Sarah is Edmund’s niece and my 2x great grandmother. By the time of the 1851 census Sarah’s mother, Mary Ann Tattersall, had married William Wildman on 20 December 1841 at St Andrews church, Kildwick. Their marriage certificate below confirms Mary Ann’s father as Patrick Tattersall. There is no doubt in my mind that the Sarah Wildman from this census is my Sarah Tattersall. Or should she be Sarah Yewdal? Sarah Tattersall married James Buckley and I got a copy of their marriage certificate as long ago 10 November 2003. They were married on 26 April 1857 at the Parish Church of Bingley in West Yorkshire. Both Sarah and James gave their address as Harden – a small parish about 2 miles from Bingley. I haven’t been able to scan the marriage certificate but hopefully from the photograph below you can see that James is a bachelor and Sarah a spinster. Both are “of full age”. James gave his father’s name as Thomas Buckley. The space for Sarah’s father has been left blank. With renewed enthusiasm over the past few weeks I have been filling in the Tattersall line of my family tree. I’m not sure why I was looking again for the marriage of Sarah and James Buckley – or even if I was. But one of those coincidences happened that throws everything into a new light. I came across two marriage entries with same reference number in the June quarter of 1856 in Keighley, West Yorkshire – one for Sarah Yudle and James Buckley and another for Sarah Tattersall and James Buckley. So obviously I had to order them – were there really two? Anyway about a week after ordering the certificates I had a phone call from the General Register Office (GRO) to check my order. There was in fact only one marriage – for Sarah Yudle and James Buckley. However there was a note in the margin that at some point the name Yudle had been changed to Tattersall. So the certificate finally arrives – see image below. This shows that James Buckley married Sarah Yudle at Keighley Register Office on 16 June 1856. James gives his age as 19 and Sarah as 20. James is a bachelor and Sarah a spinster. James gave his address as Coney Lane, Keighley and Sarah as Pinfold, Keighley. James gives his father’s name as Thomas Buckley and Sarah as Ishmael Yudle. There is indeed a note in the margin which reads “ In Col.2 for “Yudle” substitute “Tattersall” and for the mark of Sarah “Yudle” substitute mark of Sarah “Tattersall”. Corrected on 1st day of September 1856 by me George Smith Registrar in the presence of James Buckley X who hereunto sets his mark, Sarah Buckley X who hereunto sets her mark”. So eleven weeks after their marriage Sarah changes her name on the marriage certificate. I can only speculate as to the reason. Perhaps her mother wasn’t happy that Ishmael Yudle was given as the father? Perhaps Ishamel Yudle wasn’t too keen either (if indeed he was aware)? But then nearly ten months after marrying at Keighley Register Office in June 1856 James and Sarah marry again at Bingley Parish Church on 26 April 1857. Certainly some of the facts given on this 1857 marriage certificate are not correct. One other interesting feature is that one of the witnesses to the 1856 marriage is Job Vickerman. In 1857 one of the witnesses is Mary Vickerman. A search of the 1851 census for Keighley reveals a Vickerman family with brother and sister Job and Mary – both in the same age range as James and Sarah. I think it’s a safe bet that these are the witnesses. Perhaps Job wasn’t prepared to be a witness to a second and false marriage but persuaded his sister to do it – pure speculation on my part. So what I thought was a straightforward case of an illegitimate ancestor resulted in a more interesting story. This is an update to a blog post I published on 1 November 2015. Back in August 2015 I finally got round to ordering a copy of John Musgrove’s death certificate. And finally had confirmation of the family story – cause of death was “suicide by hanging – unsound mind”. According to the death certificate John died at Railway Road, Clitheroe, Lancashire, on 17 September 1884. An inquest was held by the Deputy Coroner J C Anderton on the same date. Despite my best efforts in the Autumn of 2015 I wasn’t able to find any record of the inquest. I tried Clitheroe library and visited Blackburn library to search the newspaper archives. I also spoke with the Blackburn Coroners Office. There is a death notice in the local Blackburn paper but no report of the inquest. I discovered during this search that inquest records/reports were considered to be the property of the coroner and were most likely destroyed when the coroner retired. Yesterday I went to Skipton library to search the newspaper archives of the Craven Herald in connection with another relative. As a long shot I decided to try the Craven Herald, a weekly paper, to see if there was any reference to John Musgrove back in 1884. I was very fortunate to find two articles about John’s suicide. The first is from 20 September 1884 – three days after John’s death. The second is from 27 September 1884 and reports on the Coroner’s inquest. SUICIDE – At six o’clock on Wednesday morning John Musgrove, labourer, fifty two years of age, was found hanging on a gate in Railway Road, Clitheroe, quite dead. John O’Donnell, mason, found the body as he was going to his work, and immediately gave information to the police. Deceased, who lived in Water Street, Clitheroe, had been drinking hard for some weeks, and has had domestic trouble during the last few days. SUICIDE THROUGH DRINK – An inquest was held last week, before Mr J E Anderton, deputy coroner, touching the death of a labourer named John Musgrove, aged 52 years. Deceased was found hanging by his neck from a gate in a bye-road leading from Railway Road to the Gasworks, dead. A clothes line was fastened about his neck and tied to the top bar of the gate. His shoulders were resting against the lower part of the gate and his legs and the lower part of his body were on the ground. A man named John O’Donnell found the body as he was going to his work, and immediately gave information to the police. Deceased is known to have been drinking hard for some weeks, and has been in a low way during the last few years. “Deceased committed suicide whilst in an unsound state of mind” was the verdict of the jury. Another lesson for would-be genealogists is to always be on the look out for new records being added to online resources. I check the newspaper archives on Find My Past regularly. I had previously been unable to find any mention of John’s death – until this morning as I’m writing this blog post. Now I’ve found an article from the Preston Herald of 20th September 1884! SUICIDE BY HANGING – At six o’clock on Wednesday morning John Musgrove, labourer, aged 52 years, was found hanging by his neck from a gate in a bye-road leading from Railway Road to the Gasworks, dead. A clothes line was fastened about his neck and tied to the top bar of the gate. His shoulders were resting against the lower part of the gate and his legs and the lower part of his body were on the ground. A man named John O’Donnell found the body as he was going to his work, and immediately gave information to the police. Deceased is known to have been drinking hard for some weeks, and has been in a low way during the last few years. The inquest was held on Wednesday afternoon, before Mr J E Anderton, deputy coroner for the district. Joseph Musgrove, son of the deceased, identified the body as that of his father. John O’Donnell deposed to the finding of the body by him at six o’clock that morning in the position and place described above. PC Halliday said that from information he received he proceeded to the place mentioned by the last witness, and there found the body of John Musgrove. He cut the cord and conveyed him home. PC Benson said that he saw the deceased alive on Tuesday at twelve at noon. Musgrove accosted him in King Street, and said that he had been to the police office to try to get locked up, but there was no one in. Witness told him to go home and go to bed and he would feel better. He (deceased) was drunk at the time. The verdict of the jury was that deceased committed suicide whilst in an unsound state of mind. So there we have it. A bit more of the picture to a very desperate end to John’s life has now been painted. It appears that John had possibly been depressed for some years and couldn’t go on any longer. I’m left wondering what it must have been like for John in those final days and hours. What must Catherine have gone through before and after wards – perhaps not understanding what was happening to her husband as he descended into despair. They had both shared the grief of losing three of their five children – one aged 12 and two as babies. John’s father had died in a tragic accident – although this was 26 years earlier maybe that trauma stuck with John, who knows. Catherine died three years and two days later on 19 September 1887. Sarah Tattersall is my 2x great grandmother. She married James Buckley on 26 April 1857 at the Parish Church of Bingley in West Yorkshire. The marriage certificate shows that Sarah was of “full age” and was a spinster. Unfortunately there is no father’s name given on the certificate. The lack of her father’s name strongly suggests that Sarah was illegitimate. Until recently I hadn’t attempted any meaningful research on Sarah but decided it was time to see what I could find. Sarah died on 24 January 1880 from heart disease and was buried on 28 January 1880 at Utley Cemetery, Keighley, West Yorkshire. Here’s a photograph of her headstone. According to the census returns Sarah was born sometime around 1835 – 1837 in Keighley. Her death certificate shows her age as 43, suggesting a birth year about 1837. I had no luck searching the civil registration birth records so had to hope there would be something available from parish records on Ancestry, Find My Past or Family Search. Eventually I found something in the England & Wales Non-Conformist birth and baptism records (see the image below). So perhaps this could be the breakthrough I’ve been looking for. I can only guess at what happened between Maryann (Tattersall) and Ismael and why they didn’t go on to get married. There is a marriage transcript for Ishmael Yewdale to Emma Fowlds (or Foulds) on 19 January 1836 in Keighley – some fifteen months after the birth of Sarah. I found the following records in the 1841, 1851 and 1861 census returns on Find My Past. The census entry for 1861 has been transcribed incorrectly. I checked the original image and it is definitely Yewdal – although I know that is what I’m looking for. I can see why the transcriber would have settled on Gundal. I’ve sent a transcription amendment to Find My Past. I guess then that Ismael is therefore my 3x great grandfather. I am confident that I can fill in one of the “blanks” in my tree. The children in the census returns will be half siblings of Sarah Tattersall (my 2x great grandmother) and that’s a whole new thread to follow. There is a baptism record for Ismael Udale – 29 December 1811 in Keighley. So that fits with the previous information. His parents are shown as Joseph Udale and Agnes Sharp. Interestingly there is also an entry for maternal grandfather’s name, which is William Sharp. I have located a death registration for Ishmael Yudle in Q4 1867 in Keighley. The name Yewdal clearly has the potential for various different spellings and transcriptions but I am confident that the various records mentioned above all relate to the same person. Benjamin Gawthrop is my 1st cousin 3x removed. Our common ancestors are my 3x great grandparents Martin Gawthrop and Ann Kighley. Benjamin is the son of Benjamin Gawthrop and Elizabeth Eastwood. He is also the cousin of John Gawthrop who I have written about here and here. Benjamin was born on 10 August 1869 at Trawden in Lancashire. I have found him on the census returns for 1871, 1881, 1891 and 1901. In 1891 Benjamin is living at 3 Heath Street, Burnley, Lancashire and is described as a ‘theological student’. By 1901 he is a ‘Baptist Minister” and living at 91 Cardigan Terrace, Heaton, Newcastle Upon Tyne. On 16 April 1908 Benjamin, Jane and their three children left England. They sailed from London on the SS Orontes bound for Sydney, Australia. Sadly Jane died after only six years in Australia. Benjamin later married Constance Lillian Butler on 7 November 1916 in Randwick, New South Wales, Australia. At some point around 1918 Benjamin and Constance returned to England but I have not been able to establish exactly when this was. They had one son – John Richard – born 1920 in Sabden (near Burnley), Lancashire. All three of them went back to Australia on 23 June 1927 sailing from London on the SS Barrabool to Sydney. Here’s the extract from the ship’s passenger list. It was in Australia that Benjamin had much influence and made a big impact in the communities he served. Gawthrop was a scholarly fellow and became the College’s first lecturer in Church History. He came from Heaton Road church at Newcastle Upon Tyne, England, where he had been the minister from 1894. When he arrived there the membership was 60 and when he left 14 years later the number had risen to 388. It had been his first and only English church to that time. Born at Colne, Lancashire, and educated at Rawdon College. He came to Australia to take the pulpit of the Petersham Church where he began in June 1908 and remained until April 1918 when he returned to England. He was a strong church man and wrote and preached regularly on the importance of the church, which he firmly believed was the direct creation of Christ. He considered that being a Christian meant being a member of the church. Strongly evangelical, he shared Waldock’s conviction that being called to be a preacher of the Gospel was the highest honour Christ could bestow on any man. Both Benjamin and John Gawthrop seem to have done great work in their respective faiths. I am proud to have them as ancestors. Robert Aubrey Spink is my 1st cousin 3x removed. I mentioned him briefly in a Tombstone Tuesday post. He was born about 1883 and died on 18th April 1923. His gravestone says that he was “accidentally killed”. So I just had to find out about the accident, what happened to Robert and the cause of his death. I knew from the 1911 census that he was living in Leeds at the time. I guessed that the local newspapers would have covered the story. There is a really good family and local history department at Leeds Central Library so that was my starting point. 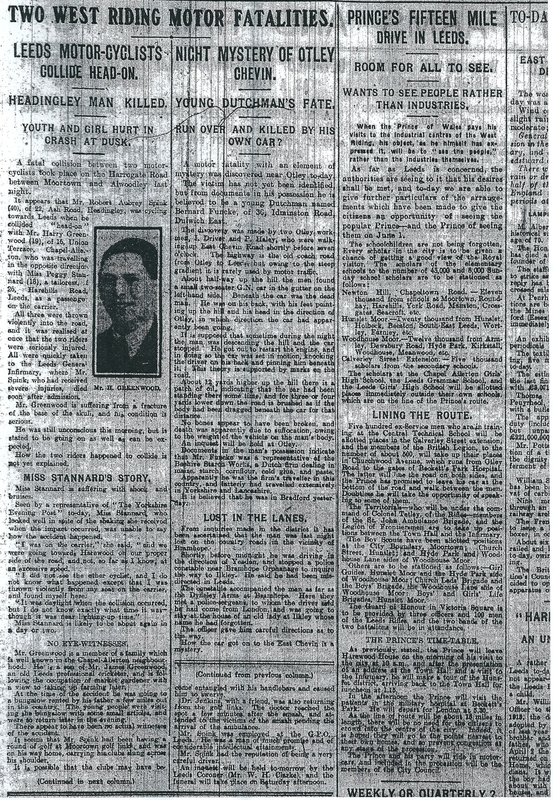 The newspaper archives for the period are on microfilm and it didn’t take long to find two stories about the fatal accident in the Yorkshire Evening Post. 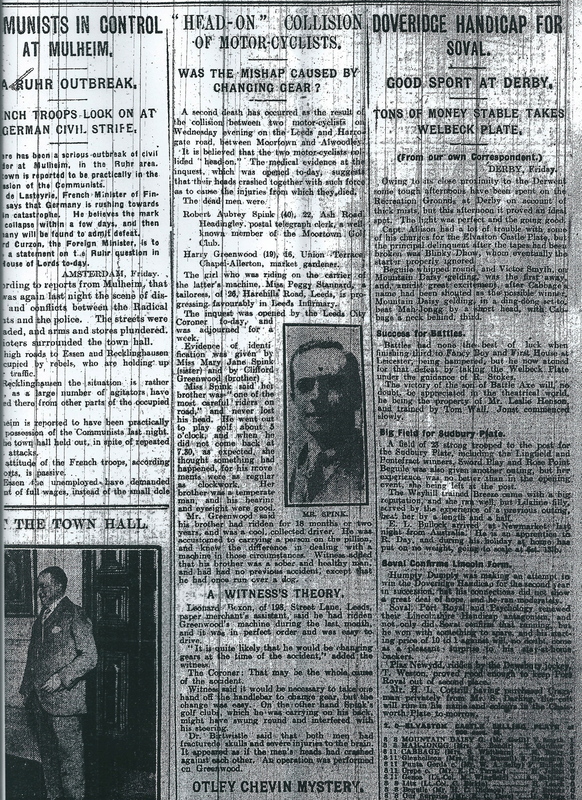 Here is the first article from the Yorkshire Evening Post on 19th April 1923. A fatal collision between two motor-cyclists took place on the Harrogate Road between Moortown and Alwoodley last night. It appears that Mr Robert Aubrey Spink (40), of 22 Ash Road, Headingley, was cycling towards Leeds when he collided “head-on” with Mr Harry Greenwood (19) of 15 Union Terrace, Chapel Allerton, who was travelling in the opposite direction with Miss Peggy Stannard (18), a tailoress, of 26 Harehills Road, Leeds, as a passenger on the carrier. All three were thrown violently into the road, and it was realised at once that the two riders were seriously injured. All were quickly taken to the Leeds General Infirmary, where Mr Spink, who had received severe injuries, died soon after admission. Mr Greenwood is suffering from a fracture of the base of the skull, and his condition is serious. He was still conscious this morning, but is stated to be going on as well as can be expected. How the two riders happened to collide is not yet explained. Miss Stannard is suffering with shock and bruises. Seen by a representative of “The Yorkshire Evening Post” today, Miss Stannard, who looked well in spite of the shaking she received when the impact occurred, was unable to say how the accident happened. Miss Stannard is likely to be about again in a day or two. Mr Greenwood is a member of a family which is well known in the Chapel Allerton neighbourhood. He is a son of Mr James Greenwood, an old Leeds professional cricketer, and is following the occupation of market gardener with a view to taking up farming later. At the time of the accident he was going to a bungalow rented by his father a few miles out in the country. The young people were visiting the bungalow with some small articles, and were to return later in the evening. There appear to have been no actual witnesses of the accident. It seems that Mr Spink had been having a round of golf at Moortown golf links, and was on his way home, carrying his clubs slung across his shoulder. It is possible that the clubs may have become entangled with his handlebars and caused him to swerve. Dr Jenkins, with a friend, was also returning from the golf links. The doctor reached the spot a few minutes after the smash, and attended to the victims of the smash pending the arrival of the ambulance. Mr Spink was employed at the GPO, Leeds. He was a man of much promise and of considerable intellectual attainment. Mr Spink had the reputation of being a very careful driver. An inquest will be held tomorrow by the Leeds Coroner (Mr W H Clarke), and the funeral will take place on Saturday afternoon. This was clearly a very tragic accident – but who, if anyone was to blame? I will post the second newspaper article about the inquest next week. Catherine Ainsworth is my 2 x great grandmother and she was born on this day (13th January) in 1837. She comes from a small market town in Lancashire called Darwen which is near to it’s larger neighbour Blackburn. Ten years later and Catherine is still living with her parents at 19 Bolton Street, Over Darwen, Blackburn. By this time another sister has been born – Sarah Jane in 1843. Catherine is working as a “power loom weaver”. Sometime during the next four years Catherine met John Musgrove and they married on 6th October 1855 at the Parish Church of Blackburn. The witnesses at the marriage were Robert Day and Mary Anne Day – I have no information about these people and assume that they were friends. Another child, George, was born and died on 2oth August 1857. The census shows John working as a “carter” and Catherine working as a “power loom cotton weaver”. The 1871 UK census is a bit of a mystery for me. First of all the census entry records her name as Catherina Mosgrove and her occupation as “cotton weaver”. She is living at 18 Ellen Street, Over Darwen. Also with her are two sons Thomas (10) and Joseph (6). Thomas is shown as a “cotton weaver” and Joseph as a “scholar”. The one other person at the address is Joseph Ainsworth (66) – this is Catherine’s father and he is a widower. Secondly I haven’t been able to find any trace of John Musgrove (Catherine’s husband). I also know that John and Catherine had another son, James, who was born on 5th August 1868 and died on 23th November the same year. Sometime during the next ten years the family moved back to Clitheroe and the 1881 UK census shows them living at 42 Water Street, Clitheroe. The household consists of John, Catherine and their son Joseph (16). There are also two boarders – John Reid and Hannah Reid. It isn’t clear to me yet whether these two people are relatives or not. Catherine died on 19th September 1887 and her death is registered in the Clitheroe district.